Noguchi sensei is good with many ryû, but his understanding of the Gyokko ryû is the best. If I’m not mistaking, I think that his whole taijutsu is largely influenced by the depth of the Gyokko ryû. During his last class, we covered (again) the first level of the Gyokko ryû: Kokû, Renyō, Gyaku Nagare, Dan Shu, Dan Shi, etc. Once again, it required a lot of attention from my part to read his movements. His taijutsu is so far from the forms of the densho that, often, I am incapable of recognizing the original waza. Every basic waza is “exploded” into something different. Only the Kaname (1) remains. The form is gone. Nothing is “finished” and uke cannot rely on his sensations. Uke is defeated by his illusions. 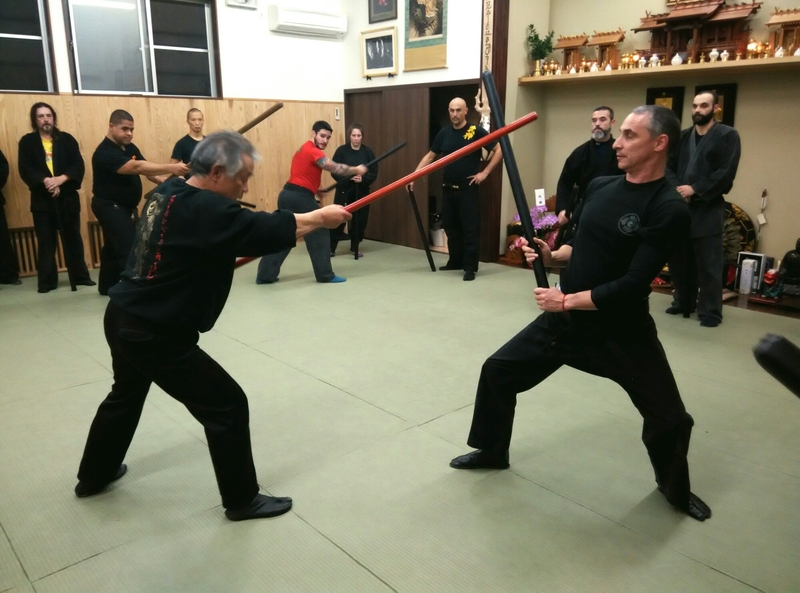 In a way, it was the follow-up of the last class we had with Hatsumi sensei for his birthday. The way Noguchi sensei is moving is a double-bind. When he announces the name of the technique, we expect a given form. When he does it, something different pops out, that is so far from the basic form, that we are captured by what we are expecting. This is a pure manipulation, similar to what magicians do when they are doing their tricks. Funnily, things would be easier for us, if we didn’t know what he was doing next. I guess that beginners, thanks to their lack of knowledge, have less problems than us. And this is why I really love his classes, because they question my understanding of the art. I’m lost and happy at the same time. What Noguchi sensei is showing is the famous “next step” that Hatsumi sensei was telling us again during the last class. Being able to see novelty in techniques we have been repeating for years is the reason why I’m training three times a year in Japan. As I said in the introduction, Noguchi sensei is the man of Gyokko ryû and this lightens his whole taijutsu in a very particular way. It makes sense. As sensei wrote in “unarmed fighting techniques of the samurai”, the Gyokko ryû is the origin of all Japanese Budō. Therefore, mastering this specific ryûha, gives access to the understanding of all Budō. 2. In 2005, we studied Kasumi no hō and Gyokko no bō. This was the third year of the Juppō Sesshō series. The main difference in the use of the long staff is that the hands are often positive at the mid section instead of the last inch of the weapon. There is no densho of bō jutsu in the Gyokko ryû.